Successful Kickstarter Campaigners "Inboard" copying builds from the Endless Sphere DIY Community? "It definitely seems as though the creators of the Inboard are paying close attention to what is happening in the DIY Community. They would be mad not to!" In April 2015 a new Kickstarter campaign was successfully funded! The tag line for the campaign was "Inboard: The World's First Skateboard with In-Wheel Motors"
Technically speaking it should read something like "The world's first electric skateboard, advertised on kickstarter, with hub motors". Just to clarify; Hub motors are not a new concept, they are commonly used in ebikes and scooters and only recently in skateboards. So Inboard technically aren't the first people to use them on a skateboard. The DIY community has been meddling with the concept of hub motors well before inboard made there claim to fame. But Inboard definitely deserves the credit for bringing the concept to the masses, which in the long run is great for the development of the concept. So it seems that basically the team of designers & engineers at Inboard are just creating what the DIYers have been building in there garages, just slightly more fancy looking version... I guess when you raise over 400K your stuff should look fancy! So are Inboard copying the builds from the DIY Community? Before Inboard started their Kickstarter campaign hub motors where already starting to gain momentum in online forums & in the garages of hobbyists. In December 2014 Endless Sphere forum user "jacobbloy" published his hub motor designs to the community & started a beta program to further test his design. 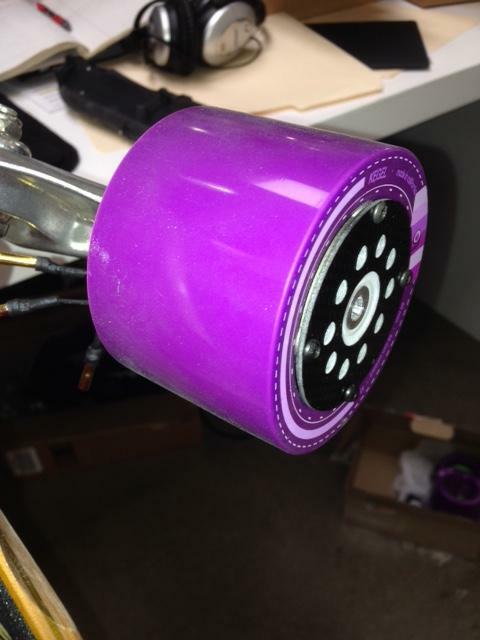 Inboard have also changed their hub motor design substantially, making it much more similar to the Jacob Bloy design which uses arc shaped magnets. Video of me riding with dual jacobbloy hub motors. Suprise Suprise... it's a VESC.to the VESC. There is no wonder they are using the VESC, it is the best motor controller that is currently available for builders of electric skateboards! It is packed with features and is open source, so technically anyone can use it. The original designer Benjamin Vedder is passionate about open source development and he says he is not "in it for the money" but he definitely the deserves credit, which until today was not being given from the team at Inboard! However to their credit they have just today publicly confirmed they are using the VESC for "testing purpose". Below is the letter published on the Endless Sphere thread about the VESC. The Inboard is currently over due with no firm date for delivery, But one thing is guranteed if they keep copying the DIY community this board will be fantastic.